Chicago-area Muslims who want to educate and inform about their peaceful religion say they already feel the effects of the battle being waged in the Middle East, thousands of miles away. Gain Peace is an educational campaign that aims to dispel misperceptions about Islam as a violent, unforgiving religion. But, Ahmed says, education has become increasingly difficult as the terrorist group known as ISIS continues to wage war in the middle east. “When there is any crisis in the Middle East, any tensions, then the rate increases about 10 to 15 percent,” said Ahmed. ISIS has gained control of much of Iraq and important areas of Syria, and their war mongering has seized on American’s fears that the religion is hostile. “The Muslim community is definitely bracing itself,” said Angie Emara, the founder My Jihad. 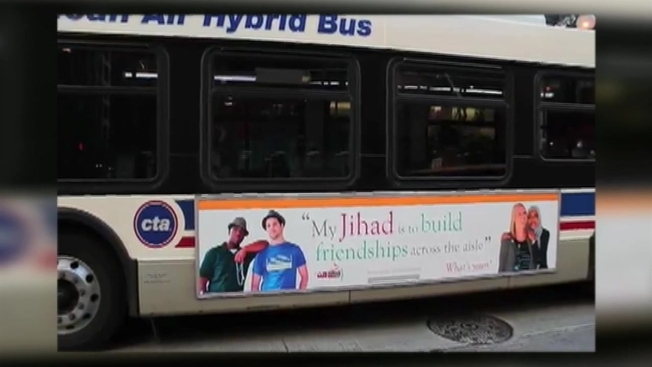 Emara launched the public education campaign MyJihad in 2012, to take back Islam from Muslim and anti-Muslim extremists. Much of their work has focused on sharing the proper meaning of Jihad, as believed and practiced by the majority of Muslims. “Everything that we have put out there and our lives is getting undone yet again because a group of people are trying to claim they are Muslim and acting in the name of religion,” she said. ISIS fighters have beheaded three Westerners in recent months and murdered countless Iraqis and Syrians. Sahloul has volunteered with the Syrian American Medical Society the last two years at refugee camps in both Turkey and Jordan. “Both of my parents were born and raised in Syria so obviously the crisis going on in Syria has affected me personally,” said Sahloul. And it has affected many other American Muslims. For more information on MyJihad visit their web site. For more information on the Syrian American Medical Society visit their web site.